UFO SIGHTINGS DAILY: Argentina: Army Sergeant Sees a Train-Shaped UFO (1977), Photo, UFO Sighting News. 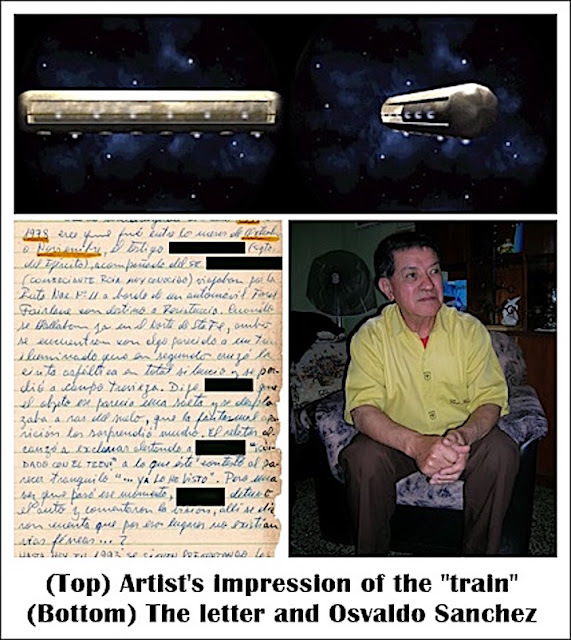 Argentina: Army Sergeant Sees a Train-Shaped UFO (1977), Photo, UFO Sighting News. Here is a really fascinating story about a UFO that looks like a train. Honestly, alien tech propulsion systems could make a mountain fly if you strapped enough of the alien tech to it, so yes, its possible. Argentina: Army Sergeant Sees a Train-Shaped UFO By Andrea Pérez Simondini Investigation conducted by Carlos Iurchuk Material by Osvaldo Sánchez In October 2010, researcher Carlos Iurchuck made a trip to the Chaco following the trail of cases experienced by military personnel. On October 9, he held a meeting with Osvaldo Sánchez, a researcher and broadcaster who is unquestionably the greatest compiler of case histories in that province. Osvaldo is a retired policeman who once held the rank of commissioner. He became interested in the UFO phenomenon as a result of the stories told by members of the police force, involving experiences in various parts of the Chaco. He has hosted the "Encuentros Cercanos con el Mas Alla" radio show for over 35 years, and after a personal interview, he was kind enough to give Carlos some material, including pages he had written years ago, describing local events as they were told to him. Thus, we share with you an even from the 1970s: "In the early morning hours of 1977 or 1978, perhaps during the months of October or November, the eyewitness, Army sergeant [name withheld], in the company of Mr. [name withheld], a well-known businessman in the province, were travelling along National Route 11 in a Ford Fairlane heading toward Resistencia. When they were north of Santa Fe, both men saw something resembling an "illuminated train" that crossed the road in complete silence and lost itself in the fields. "He said the object looked like "an arrow" and moved flush to the ground. The ghostly apparition startled them greatly. The person telling the story exclaimed - "look out for the train", although his companion replied that he was already aware of it. Once the moment was over, they stopped the car to remark on their sighting, realizing only then that no railroad tracks existed in that area. To this very day in 1993, the witnesses still wonder: "what was that?"